Memory Bears by Susan are special teddy bears created from a deceased loved ones article of clothing. Shirts, dresses, blankets, uniforms, sweatshirts, t-shirts, lightweight jackets, blouses, nightgowns, and bathrobes, are all suitable for creating a Memory Bear by Susan. 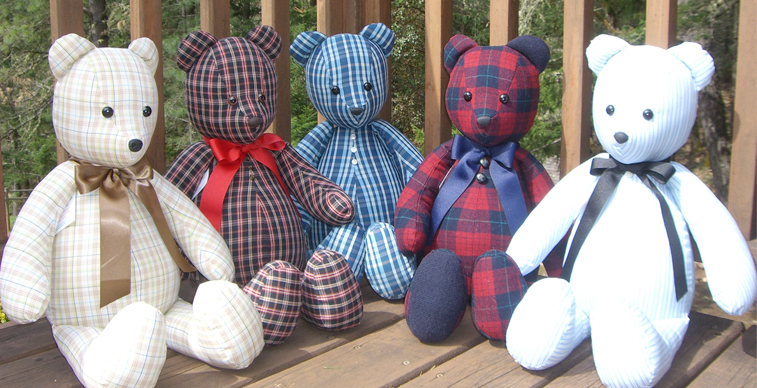 Memory Bears by Susan make wonderful and thoughtful bereavement gifts for family and friends. These soft friends are designed to be admired, hugged and displayed to keep your loved one close to your heart. Memory Bears By Susan from Jake Huddleston on Vimeo. Memory Bears by Susan are made with safety eyes and noses and are suitable for older children, but are not intended to be toys. Each bear comes embroidered with your loved ones initials or name. All bears have bows, unless something else is suitable (bandana, scarf, etc.). I intentionally make Memory Bears in a simple manner, without movable (rotating) arms and legs, so as to provide a quality heirloom keepsake at an affordable price. It's important to me that a Memory Bear by Susan be made well, honoring your loved-one, but not so complex that the bear becomes cost prohibitive to my customers. Quality, creativity, and no compromising - that's my motto at Memory Bears by Susan. Cremains may also be placed inside your Memory Bear by Susan as an added keepsake. Please include a small ziplock baggie containing the cremains and I will put them in a small canister. Each Memory Bear is personalized and reflects the personality of those who are no longer with us, when at all possible. I can incorporate personal items that you send me, or I can accessorize the bear based on your suggestions from my assortment of "props". I believe Memory Bears by Susan offers several personal touches that are not found at other sites, at no additional cost. © 2013 “Memory Bears by Susan”. All Rights Reserved.